Two weeks ago I launched CashNotify, my first app for Mac. The initial feedbacks were amazing, with so many constructive requests (multi-account support anyone?) 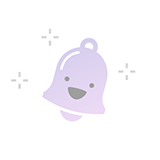 that I joined forces with my partner-in-crime, Bastien, to grow CashNotify together. Here’s why we’re building it, and why you should care. This is our introductory post for CashNotify, an app for businesses who want to know what’s happening in their Stripe account. To fully enjoy it, you should read it while listening to Abba — Money Money Money. Then we had our first failed payment. The whole experience was so painful: first, our customer had to notify us. Then we had to figure out how to remove the fraud alert, before finally being able to ask our customer to try again. In the end we solved the issue and were paid. But we could have lost that customer. At the very least, we could have saved ourselves and our customer from some stress by being proactive, and calling him as soon as we knew there was a problem with the payment. So I looked for solutions to get notified of such events. It turns out that it’s not easy. Stripe’s official documentation requires you to set-up a webhook and write server-side code (PHP, Ruby, etc.). You could hack something through IFTTT recipes, but that’s not what I’d call reliable. Email and mobile apps are big No-No’s, because both are what I call Productive-Time-Suckers™. I work, and I try very hard to stay focused. and let me easily catch on the inevitably missed notifications. The closest thing I found was Alex Maccaw’s Stripe Push project. Unfortunately it’s not maintained, and I never managed to make it work. 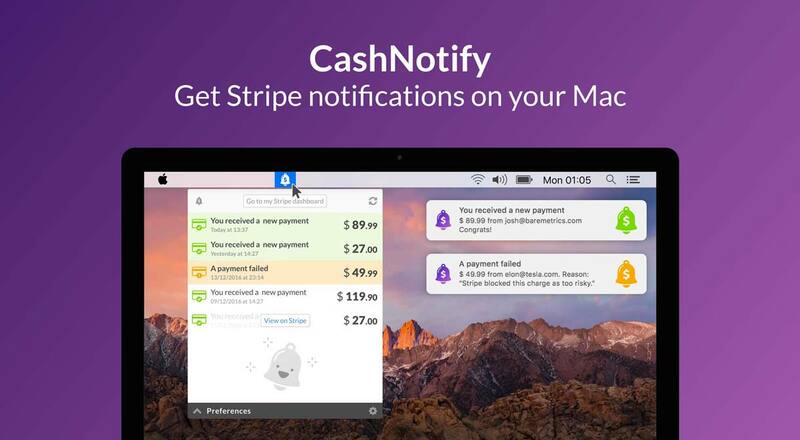 So I set up to build an easy and simple app to get Stripe notifications on macOS, named CashNotify. It automatically retrieves events from your Stripe account (such as successful or failed payments), and pushes notifications to your desktop when something happens in your account. If you don’t want the notifications, fear not! You will still view all your latest Stripe events from your menubar, and can access the full-details page on Stripe in 1 click. Access your Stripe events from your menu bar, only one icon away. No more logging into your browser or loading that (otherwise nice) dashboard. Start easily. Your Stripe API key is the only thing CashNotify needs to work. This is one click to get it, and one click to paste it. Then let CashNotify always run in the background, so you don’t miss anything. Stay secure. All data comes straight from Stripe to your desktop. No intermediate server is involved. 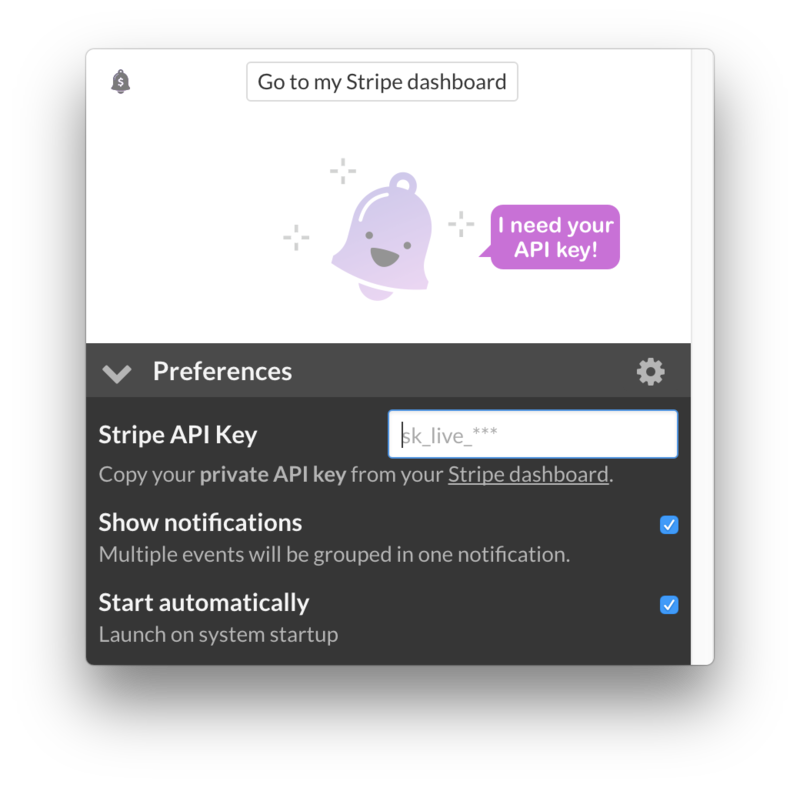 Your Stripe API key is encrypted in your local keychain. So you know, it’s safe. Work with any service using Stripe. Wether you use Stripe directly via their API, or via Shopify, Squarespace, Weebly, BigCommerce or any other compatible e-commerce, CashNotify will work. Be confident: it’s featured in Stripe’s official app directory. I spent a few weeks reaching out to people who I think would extract the most value of the app. People like bootstrappers, solo founders, consultants, digital nomads, people who are selling products online. Turns out that these guys love CashNotify! It is such an easy lightweight to keep an eye on things, especially right after an ad campaign, new coupon, or a website update. Using Stripe? Here’s how CashNotify can help you. Pieter is an entrepreneur who sells many digital products. CashNotify enables him to track how much he makes every day across his business, at a glance. Claire has a consulting gig generating low volume / large sums. CashNotify triggers her to jump on the phone and contact the customer if a payment fails, as soon as it occurs. David is a small-biz owner, selling a recurring subscription product. 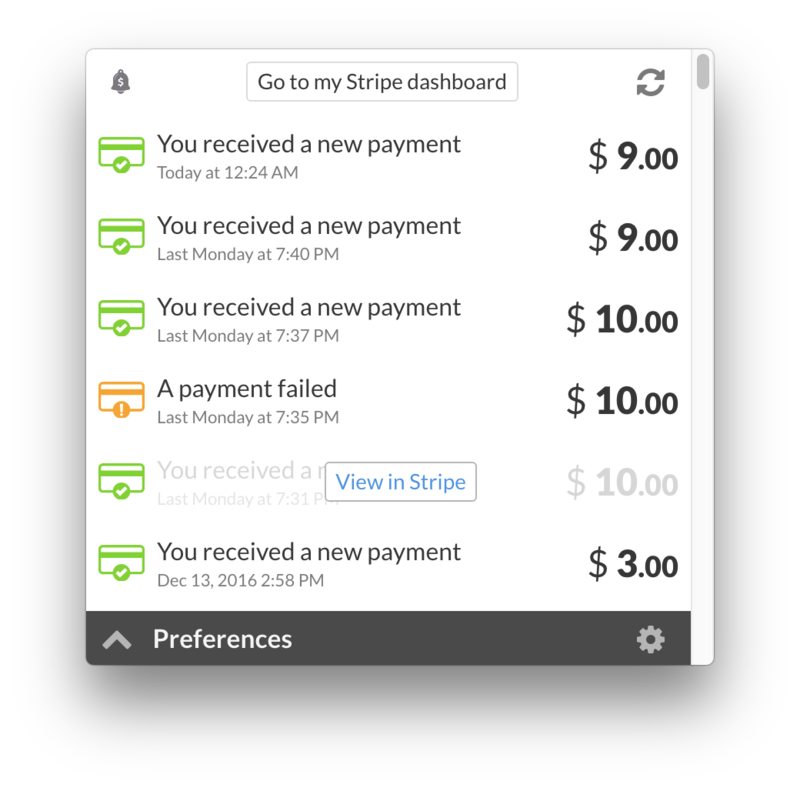 They often need to make TEST payments on Stripe. 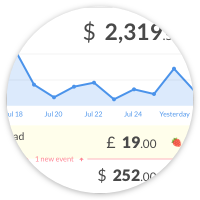 CashNotify helps his team do it better and faster, by not having to go through Stripe’s logs to see payment results. CashNotify is built with freelancers and small businesses in mind. If you value your time and money, and can’t spend your day in Stripe’s dashboard, then it’s been designed for you. Was this helpful? Share 💚 on Medium so others can find it. Part of this post has been adapted from the interview I gave to BetaList.